Lieutenant Commander (LCdr) Carter S. Luma-ang of the Hydrography Branch (HB) graduated from the National Defense College of the Philippines (NDCP) at Camp General Emilio Aguinaldo, Quezon City, on 01 September 2016, earning the Master in National Security Administration (MNSA) degree and the Bronze Medal in the Best in Thesis Award for his thesis titled "Sea Level Rise and its Implication to the National Territory and the Different Maritime Zones of the Philippines". He is the first uniformed officer from the Hydrography Branch to finish the MNSA program. 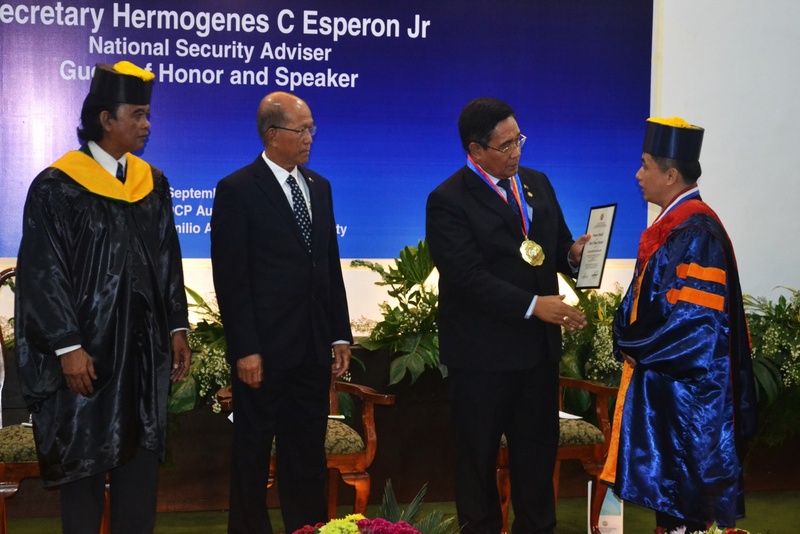 LCdr Luma-ang (right) receives his medal and certificate from the Guest of Honor, National Security Adviser Hermogenes C. Esperon Jr. (2nd from right), while NDCP Officer In Charge Director Rolando G. Junco (left) and Secretary of National Defense Delfin N. Lorenzana (2nd from left) look on. LCdr. Luma-ang graduated along with 64 other members of the MNSA Regular Class 51 (RC51) for calendar year 2015-2016. The class is composed of 45 senior officers from the Armed Forces of the Philippines (AFP), 10 executives from civilian government agencies, 4 executives from the private sector, and 6 senior foreign military officers. This class also holds the record of having the most number of graduating members and is one of the few classes with 100 percent survival rate. He is also the youngest member of RC51, being 37 at the time of admission. The minimum age for admission in the MNSA program is 35 years while the maximum age is 55 years. The Gold Medal and Silver Medal awardees in the Best in Thesis category are Atty. Charmaine Serna-Chua of the Department of Foreign Affairs and Capt. Sumeet Singh Sodhi of the Indian Navy, respectively. NAMRIA graduates of the MNSA program who are still in the service are Directors Rijaldia N. Santos and Ruel DM. Belen, and Assistant Director Nelson M. De Leon. Retired NAMRIA NDCP alumni include former NAMRIA Administrators Isidro S. Fajardo, Diony A. Ventura, and Evangeline C. Cruzado and former Administrative Division chief, Mr. Nicolas Rustum Z. Bolaños. MNSA RC51 with OIC-NDCP Brig. Gen Rolando G. Jungco, AFP (seated 5th from left) and NDCP staff. The MNSA degree is the primary course offered by the NDCP, traditionally where “admission is an honor.” It is a one-year, full-time postgraduate degree course that involves classroom work, lectures, case studies, and enhancement travels. The MNSA program is unique because aside from the core and foundation courses, it also includes several local travels for the National Security and Development Studies, foreign travel for the Global Security and Development Studies, and pre-commission course for non-military students. A thesis with a topic on national security is also required for every student. Presidential Decree No. 190, dated 11 May 1973, created the NDCP to develop qualified military leaders and civilian executives for strategic national policy formulation and competency for high command. The NDCP has the broad mission to prepare and develop potential national defense leaders, civilian officials of the different branches of the government, and selected executives from the private sector for more effective participation in national security formulation, for high command and staff duty, and for the conduct of international studies to serve as bases for national policies. LCdr Luma-ang and his fellow civilian classmates are currently in the process of completing their requirements for them to be commissioned in the AFP reserve force. 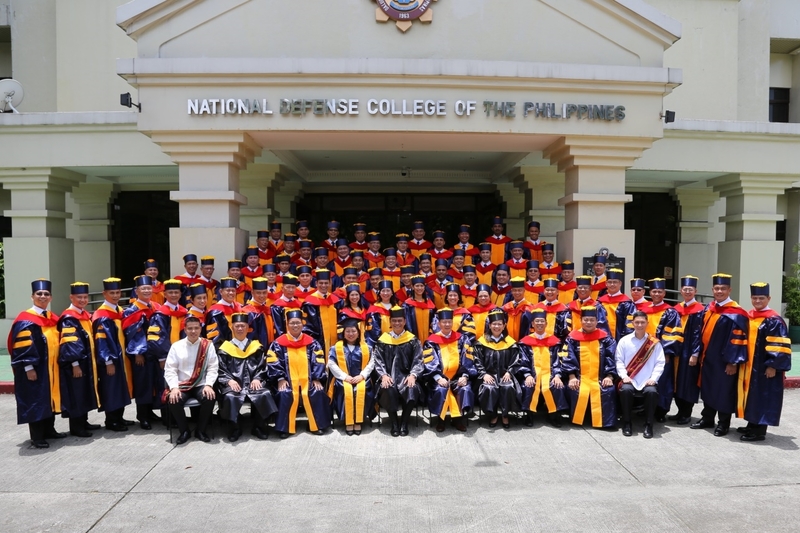 Under the law, civilians who will graduate from the NDCP are entitled to the initial rank of Lieutenant Colonel (or Commander) and will have to choose their branch of service whether in the Philippine Army, Philippine Air Force or the Philippine Navy.